Under the theme “From Exclusion to Power,” hundreds of workers and community members gathered in Birmingham, Ala., from Dec. 10 to 12 for the eighth Bi-Annual Southern Human Rights Organizers Conference. March on opening day of Southern Human Rights Organizers Conference, in Birmingham, Ala. Carrying lead banner are Daniel Castellanos; Pamela Brown, Community Voices Heard; and Araceli Herrera Castillo (left to right). The gathering opened with a press conference — on International Human Rights Day — that highlighted the work of the Excluded Workers Congress and announced a new report that examines the plight of workers barred from labor protections and the right to organize. Included in the press conference were the congress’s nine sectors, including domestic workers, farmworkers, taxi drivers, restaurant workers, day laborers, guest workers, workers from right-to-work states, workfare workers and formerly incarcerated workers. Organizations active in the congress include Domestic Workers United, the National Domestic Worker Alliance, the Coalition of Immokalee Workers, All of Us or None, Community Voices Heard, the Southwest Workers Union, Black Workers for Justice, Alabama Day Laborers and Jobs with Justice. Their members addressed workplace conditions and their fights for recognition, dignity and better wages. Araceli Herrera Castillo, a 20-year domestic worker from San Antonio, Texas, and SWU and NDWA member, said that they are demanding that the International Labor Organization pass a convention on domestic workers’ rights in June 2011 at their 100th labor congress. “We are demanding our basic rights to be implemented here, like the basic right to organize,” stated Herrera. 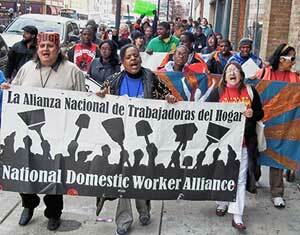 Activists marched down Birmingham sidewalks to support domestic worker organizing. They chanted, “Free, Free Domestic Workers! End, End Slavery!” and “!Mujeres marchando, el mundo van cambiando!” They went to the bus terminal, a hub from which domestic workers go “over the mountain” to the suburbs to clean homes and take care of wealthy families. The Excluded Workers Congress first convened at the U.S. Social Forum in June. Many of its partner organizations gathered for its official founding in September at the AFL-CIO headquarters in Washington, D.C. The congress is fighting these workers’ exclusion from the National Labor Relations Act, which excludes farmworkers and domestic workers; from the Fair Labor Standards Act, which bars many workers from minimum wage and overtime laws; from the Occupational Safety and Health Act, Civil Rights Act Title VII anti-discrimination protections; and from state labor laws related to the Taft-Hartley Act. The congress has made gains: Rep. George Miller has agreed to introduce the POWER (Protect Our Workers Against Exploitation and Retaliation) Act in the House of Representatives, and Secretary of Labor Hilda Solis said she would meet with excluded workers. The act was introduced in the Senate in April by Sen. Robert Menendez, among others. SHROC provided opportunities for other issues and movements to converge. Workshops and strategy sessions focused on the national fightback to defend education and to end the school-to-prison pipeline. Others discussed expanding the fight for human rights to include environmental justice and health care. An international panel spoke on U.S. imperialism’s impact around the world. On the Haitian people’s fight for human and democratic rights, Wadner Pierre stated, “You cannot have an election in Haiti without including Fanmi Lavalas,” criticizing the U.S. role there. Fanmi Lavalas, which was banned from participating in Haiti’s recent election, is the party of democratically elected President Jean-Bertrand Aristide, who was ousted in a U.S.-led coup in 2004. Emria Woods, from Liberia, discussed the negative global role of the U.S. in the fight for human rights. She addressed the struggle in Africa against the U.S. African Command (Africom) and stressed that the U.S. goal there is to secure oil markets. “The fact that 25 percent of U.S. oil now comes from Africa was the leading cause for the establishment of Africom,” stated Woods. Other panelists were Jorge Guerrero Veloz, from the Red Afrovenezolana, and Charo Mina Rojas, from the Black Communities’ Process in Colombia. Organizers left Birmingham strengthened by the unity at the conference and the fightbacks going on across the South, vowing to move ahead. Organize the South!